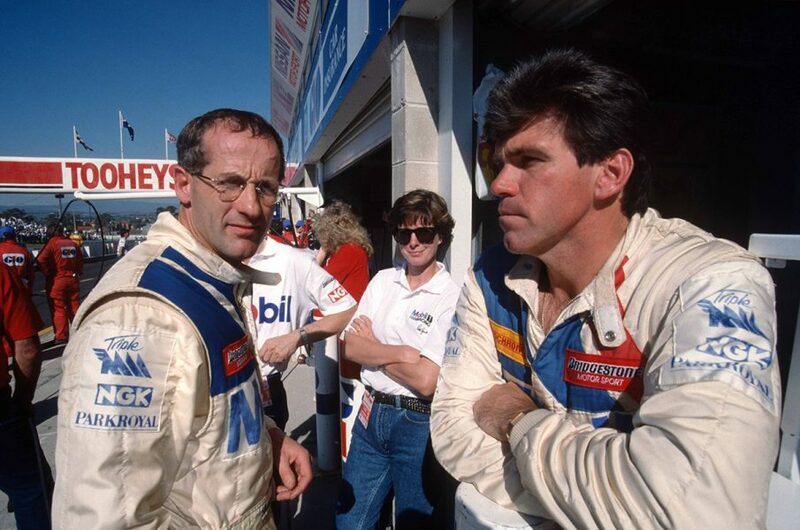 Andrew Miedecke started his racing career in the open-wheel scene, but made his mark in local touring car racing as a fast privateer and an enduro ‘gun for hire’. Third place in the 1997 Primus 1000 Classic at Bathurst with Mark Larkham was his best result in the Great Race, but there have been many tales to tell during his time at the track. 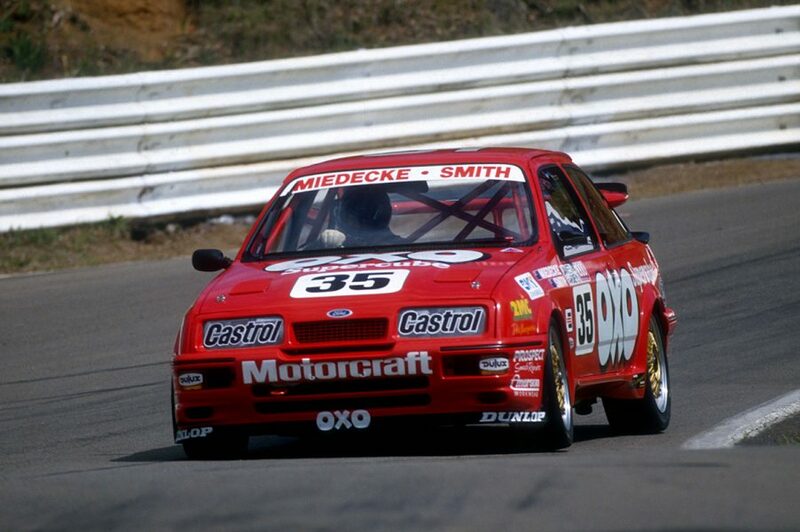 Still racing today, Miedecke spoke to us about his touring car career in this week’s edition of Saturday Sleuthing. What makes up a day in the life of Andrew Miedecke today? I’ve been stepping back from the day-to-day involvement in our automotive group. The business is still running, of course. My son George is working in it, under my general manager Steve Edwards. When I first came to Port Macquarie I had a Volvo and Honda dealership, a gravel yard and two employees. Now we employee 120 people with six locations doing everything from car sales and financing to panel repairs and paint. It is quite a mature business now. I’m starting to take a back seat. A few of our last acquisitions have seen us buy some property, moving some showrooms, running a small GT team which George and I race and, I must say, it has been a great privilege to race alongside my son. 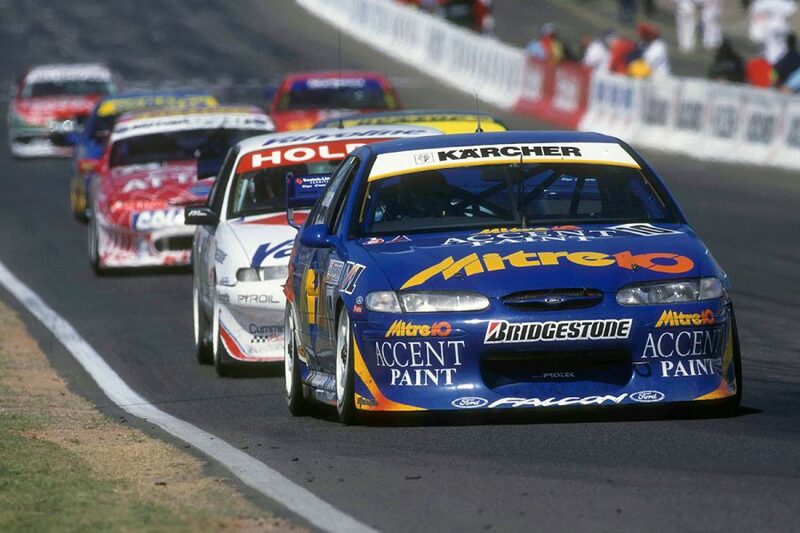 Before we jump into your racing in the Supercars era, there were a couple of significant moments in Sierras in the touring car championship. 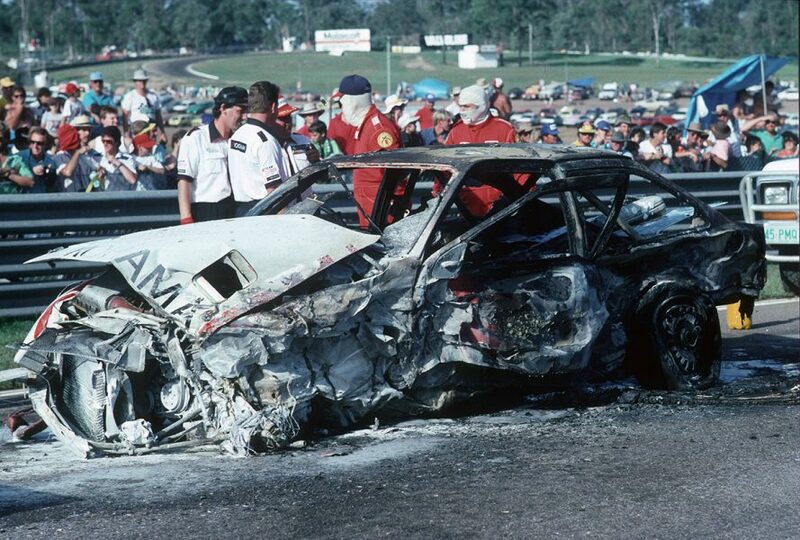 The first, a bad one, was the fireball at Lakeside in 1989. What are your memories of that? It was a very tough time. As these things do, it came at the wrong time because I was already very stretched financially, and very stretched time-wise. I had a growing car dealership that I’d taken a fair bit of money out of to fund my racing. It was a fairly minor incident. It was just a bang into the fence. Unfortunately, the thing caught fire, and unlike today, there just wasn’t the assistance around to get the fire out. The car was just left there to burn to the ground. My sponsors at the time, Yokohama and the others, chipped in and helped get me back out on track within a couple of race meetings. At the time, I had Ross and Jimmy Stone working for me, and with Les Laidlaw, they helped build a new shell. Yeah, we were on pole for Sandown, but unfortunately Don Smith, rest his soul, who was really the owner of the team, rolled the car at the end of practice (and the car did not start the race). So that was a shame, but we were right on the money at those two meetings. The Bathurst race was good. It showed what we could do. I owned my own car at the time when no one wanted to give me a go, but I guess it was a different era when teams were mainly owned by the driver. Things transitioned after that to teams that were independent and the drivers were employees, but that Bathurst 1000 was a great experience. We just had it right on the day. We were privateers and it really helped put me on the map. I remember coming over the top of the mountain on the first lap that I’d passed Steve Soper to take the lead; I could hear the crowd roaring. It was a great thing. The car itself was pretty good. It had been built in Allan Moffat’s workshop, so it was a good thing. We were well down on power, but it was beautiful to drive. I hadn’t known Allan very well up until then, but we got along like a house on fire. While the budget was tight and we were losing a lot going up and down the hill, we tried to make up for it around the corners. And again, working for Allan was terrific. 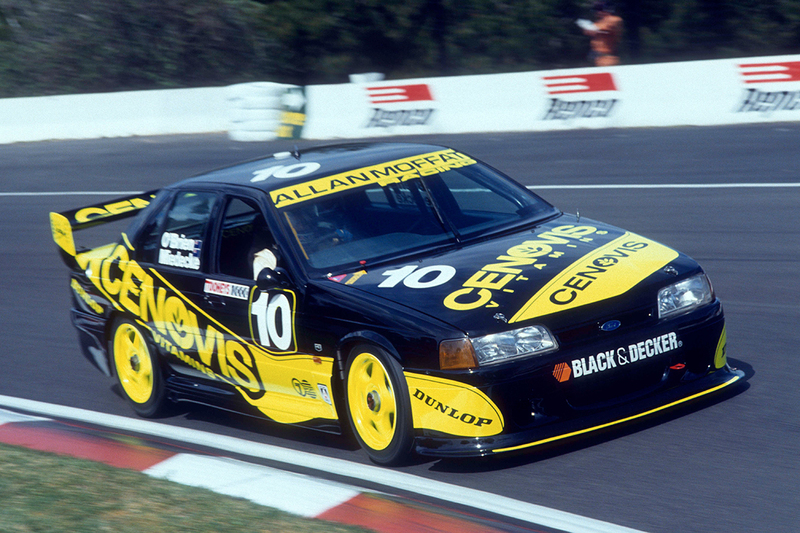 You raced with Alan Jones’ Pack Leader team in 1996 before joining Mark Larkham in 1997 in his Mitre 10 Stone Brothers Racing Falcon. This yielded your best result at the race, third place. What are your memories of that? It was a good result. We were just flat out all day. Mark had a touch with someone in the race. I had a touch. I was passing someone – I thought they saw me but they hadn’t. We had to back it out of the sand trap, so we were lucky. From there, the driver’s door didn’t open, so we had to do our driver changes through the passenger door! It was one of those races where it was a hard grind all day, but neither of us gave up. We just went flat out and ended up with the result, which was fantastic to see for Mark and Mitre 10. It was also quite satisfying for me too. I’d been racing at Bathurst for a while, and I’d led a few laps, but really, I’d never had much of a result up until then. 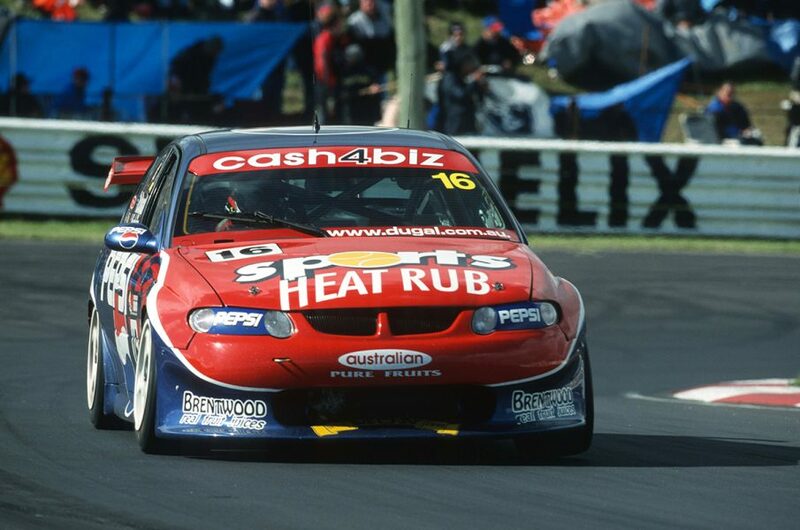 You rounded out your Supercars career as co-driver for privateer racer Dugal McDougall between 1999 and 2001. He was a young racer at the time, but it was a nice mix of youth and experience that saw you guys claim a top 10 finish in 2000. Yes. I got along really well with Dugal and his father, Peter. The car was never going to be a race winner, but we had a good time, and again, one of the years we got very close to the front during a wet race. The last time I was in the car, we were at the pointy end looking good, but as with many things in life - the things that could have been. But regardless, it was good fun and great to race with those guys. While the chapter on your Supercars career has closed, one almost opened for your son a few years ago. George raced competitively in the Super2 Series for a couple of years, but he stopped pursuing that. Were you hopeful that he might have been able to make it further? I was hopeful, and I think he is a very good driver, but I feel he put a little too much pressure on himself, and that certainly cost him some results. And the fact that he is 6’6” makes it hard to fit him into the cars! He is really quick, and it’s a shame that he missed out because I think he could have been really good. But in the end, his decision was a realistic one. 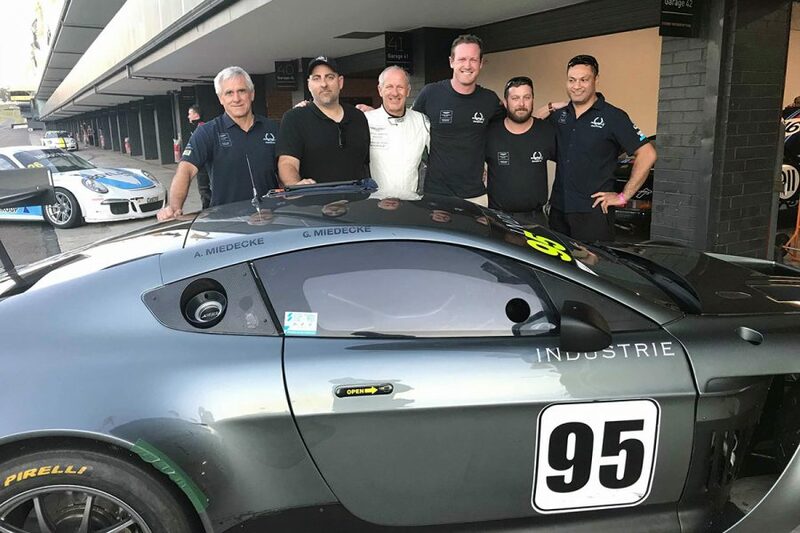 He chose a good life living in Port Macquarie with a substantial business, raising his family, and he still gets to race seriously in the GT Championship that obviously doesn’t have the bigger risks and time demands. That’s where he is at the moment.